Congratulations to Dr. Stieber and her students! It is with much sadness that we report the passing of our esteemed colleague, Dr. Walter Maya, Professor Emeritus. Dr. Maya lost his battle with lung cancer, he was 89. Congratulations to Dr. Kathryn McCulloch and her colleagues on their publication entitled "The Structure of the Bifunctional Everninomicin Biosynthetic Enzyme EvdMO1 Suggests Independent Activity of the Fused Methyltransferase-Oxidase Domains" in the journal Biochemistry. Dr. Alex John, Assistant Professor, and Chemistry undergraduate Christine Navarro just published their work entitled "Deoxydehydration using a commercial catalyst and readily available reductant" in the journal Inorganic Chemistry Communications. Congratulations on your publication! Although retired, Dr. Ernie Simpson is still active in service to the chemical profession. Simpson was just awarded the Western Regional E. Ann Nalley Award for volunteer service to the American Chemical Society. He will be honored at the October 27 awards ceremony at the 2018 nano-Western Regional Meeting in Pasadena. Congratulations to Dr. Simpson! Dr. Chantal Stieber along with two undergraduate chemistry majors, Carlos Yamamoto and Zijie Zhang, published a new crystal structure using our new XRD in the Crystallography Co-op. The paper, entitled "Crystal Structure of (n4-cyclo-octadiene)(3,3'-dimesityl-1,1'-methylenedimidazone-2,2'-diylidene)nickel (0) tetrahydrofuran mono solvate", appears in Acta Crystallographica Section E(see http://scripts.iucr.org/cgi-bin/paper?s2056989018012252). Congratulations on your publication! Congratulations to Dr. Greg Barding (Chemistry and Biochemistry, co PI), Dr. Mohammad Chaichi (Plant Sciences, co-PI). Dr. Cord Brundage (Animal and Veterinary Sciences, co-PI), and Dr. Ondieki Gekara (Animal and Veterinary Sciences, PI) who received a $150K grant award from the USDA NIFA-NLGCA program for "Enhancing Research Skills of Underrepresented Students: Summer Research Experience"
Dr. Yan Liu (Co-PI from Chemistry and Biochemistry), and Dr. Wei-jen Lin (Co-PI from Biological Sciences) and Dr. Olive Yi (PI from Human Nutrition and Food Science) received a $45K Agricultural Research Initiative (ARI) grant entitled "Determination of utilizing naringin extracted from orange pomace as an antimicrobial in active packaging films against Listeria monocytogenes"
Dr. Alex John was just awarded a $240,000 NSF RUI, for his proposal entitled "Evaluation of Ligand Effects in Molybdenum Catalyzed Deoxydehydration Reaction." Dr. John's lab is interested in development of cost-effective metal catalysts that remove adjacent hydroxyl groups from organic substrates to form a carbon-carbon double bond. Congratulations to Dr. John! Dr. Alex John and his colleagues recently published the paper entitled "Dual-catalytic decarbonylation of fatty acid methyl esters to form olefins" in the journal Chemical Communications (see DOI: 10.1039/C8CC03823F). Congratulations to Dr. John! The department recognized its scholarship winners for 2018 on Thursday, May 24th at a luncheon event. A total of $11,500 was awarded to the following students: Uyen Dinh, Quyen Huynh, Tiffany Lopez, Maiko Lunn, Stephanie Mora Garcia, Erica Hummel, Sevan Menachekanian, Alexander Wang, and Riddhima Kumar. Congratulations to all! Dr. Yan Liu, who joined the Chemistry and Biochemistry faculty in Fall 2012, has been granted tenure and promotion to Associate Professor beginning August 20, 2018. Congratulations to Dr. Liu! This year, in the SPICE Innovative Approaches to Instruction program, Drs. Katie McCulloch and Chantal Stieber were awarded $18.5k to develop a protein crystallography module and purchase laptops for use in the undergraduate biochemistry laboratory. For the SPICE classroom and laboratory modernization programs, Drs. Yan Liu and Alex John were awarded $25k to acquire a SMART flash chromstography system. These efforts by our faculty continue to help provide student access to modern instrumentation and techniques as we prepare them to be workforce ready. Congratulations to Dr. Greg Barding for his selection as the 2018 Outstanding Faculty Advisor for the College of Science. Barding was recognized for his work in advising and mentoring students at the University's Outstanding Advisor Awards on April 26th. Dr. Kathryn McCulloch's proposal entitled "Investigating the Structural Basis of Secondary Bile Acid Production" was selected for funding ($14,058) in the CSUPERB New Investigator Program. Congratulations to Dr. McCulloch! Dr. Greg Barding and coworkers published their work entitled A Metabolomics Study of BPTES Altered Metabolism in Human Breast Cancer Cell Lines in the May 15 issue of Frontiers in Molecular Biosciences. Dr. Laurie Starkey has published the second edition of her book entitled "Introduction of Strategies of Organic Synthesis"
The article entitled "Metabolism and Biodegradation of Spacecraft Cleaning Reagents by Strains of Spacecraft-Associated Acinetobacter" was recently published in the journal Astrobiology. This work, under the guidance of Dr. Rakesh Mogul and Dr. Gregory Barding of the Chemistry and Biochemistry Department, involved 22 student co-authors from Cal Poly Pomona-17 from the Chemistry and 5 from Biological Sciences. The paper explores how cleaning reagents used in spacecraft assembly facilities may support the existence of microbial communities, an important factor in preventing biological contamination in future life-detecting missions in our solar system. 2018 Goldstein Distinguished Student Research Awards AnnouncedAfter a competitive selection process, Timothy Siu (undergraduate) and Nathan Wagner (graduate) have each won $2,000 Goldstein Student Research Award. This award recognizes outstanding research conducted by students. Both Tim and Nate conduct research with Dr. Alex John, Assistant Professor of Organic Chemistry. In addition, several students received an honorable mention award for their work including Christine Navarro, Stephanie Mora Garcia, Tiffany Lopez, Sevan Menachekanian, and Sylvia Speights. Congratulations to all of our students on their accomplishments! February 15, 2018 hailed the grand opening of the Cal Poly Pomona Crystallography Co-Op. This facility houses a Bruker D8 Venture diffractometer that will be used by faculty and students for both research and instructional purposes. Acquisition of this advanced instrumentation was made possible by a Department of Defense grant ($599,077) to Dr. Chantal Stieber (Pl) and her collaborators Dr. Kathryn McCulloch, Dr. Alex John, Dr. Bohdan Schatschneider and Dr. Hector Mireles. The facility, which is housed in the Chemistry and Biochemistry Department, is a result of the vision of Dr. Chantal Stieber, Assistant Professor. For more news and information please see the links here. Dr. Page and Dr. Barding Publish Chemical Education ScholarshipDr. Michael Page and Dr. Gregory Barding, along with former Cal Poly Pomona students Maritza Silva and Patrick Escott, published their paper entitled "The effect if Teaching the Entire Academic Year of High School Chemistry Utilizing Abstract Reasoning" in Chemistry Education and Research Practice. Work for this publication was done in two high school classrooms in our local Pomona Unified School District. Congratulations to the team for helping to improve teaching practice in the high school classroom! Dr. Michael Page Received HonorThe Black Faculty and Staff Association has chosen Dr. Michael Page, Associate Professor of Chemistry and Biochemistry, as a Diversity Champion for his support of students to bring awareness of issues to the campus community. He will be honored at a special luncheon on February 15, 2018. Congratulations to Dr. Page for his extraordinary efforts on behalf of the students. 2018 Chevy Goldstein Distinguished LectureThis year's lecture will be on Friday, April 6th from 12:00-2:00pm and will feature Dr. Paul Weiss, Professor of Chemistry and Biochemistry at UCLA. Dr. Rakesh Mogul and his group of collaborators, along with some of our own CPP students, published the paper "Microbial Community and Biochemical Dynamics of Biological Soil Crusts Across a Gradient of Surface Coverage in the Central Mohave Desert" in the highly ranked microbiology journal Frontiers of Microbiology. Dr. Mogul's work entails the study of the biochemical strategies used by microbes growing at extreme conditions and has applications to understanding life evolving during climate change. Congratulations Dr. Mogul! The American Chemical Society has recommended continued approval for our baccalaureate chemistry program! Approved programs must meet the standards set forth by the ACS to ensure they offer a rigorous and well rounded educational experience that develops students into practicing scientific professionals. The DOD has awarded Dr. Chantal Stieber (along with her co-PI's Dr. Kathryn McCulloch, Dr. Alex John, Dr. Bohdan Schatschneider, and Dr. Hector Mireles) $600k for the purchase of a single X-Ray diffractometer. This instrument will be used for research and teaching and will be housed in the Chemistry and Biochemistry Department. The instrument is tentatively scheduled to arrive in December 2017. Congratulations to the team for a major successful instrument acquisition! The committee has scheduled campus visits for all the finalists. The position will remain open until filled. The deapartment is recruiting for two organic chemistry faculty members at the Assistant rank to begin in Fall 2108. Please see http://www.cpp.edu/~faculty-affairs/open-positions/college-unit/sci/chem.shtml for the job description and information on how to apply. Dr. Alex John, Assistant Professor of Organic Chemistry, is an author on the paper entitled "Selective Decarbonylation of Fatty Acid Esters to Linear a-Olefins" that was published in the August 3 edition of Organometallics. The full article can be found at http://pubs.acs.org/doi/abs/10.1021/acs.organomet.7b00411 Congratulations to Dr. John!! Justin Tabay Cortez was just awarded a prestigious honor, being named one the President's Council Scholars for 2017-18. Recipients are selected based on high academic achievement and community involvement and receive a $3,000 scholarship. Congratulations to Justin! Dr. Chantal Stieber and Dr. Kathryn McCulloch are recipients of a SPICE Classroom Modernization Award for $24k. This will be used to purchase supplemental equipment and supplies to support the single crystal XRD. Dr. Yan Liu and Dr. Greg Barding are recipients of a SPICE Classroom Modernization Award for $25k. This will be used with matching funds from our long time donor, Mrs. Hildegard Weck to purchase a new HPLC. Dr. Laurie Starkey received a SPICE Innovative Approaches for Instruction Award for $3800. This will allow her to create a problem-based learning repository for CHM 314. Congratulations to the following students: Julie Beauchamp, Phelicita Bell, Doris Chen, Marlee Fruto, Anthony Lu, Sevan Menachekanian, Stephanie Mora Garcia, Phan Phu, and Nathan Wagner who were all awarded department scholarships this year! We were able to distribute $8,500 in scholarship funds to support our students academic endeavors thanks to the generosity of our donors. Phan Phu, an undergraduate chemistry major working in Dr. Chantal Stieber's lab, has won the 2017 Goldstein Outstanding Student Research Award for her work involving the use of X-ray emission to characterize pollutants. Phan was honored with her award at the 10th Annual Goldstein Distinguished Lecture on April 7 and will receive a $2,000 prize. Congratulations Phan! Dr. Rakesh Mogul is the recipient of a $13.5K grant from the NASA Astrobiology Institute MIRS program to conduct biochemical characterization of Alaskan Permafrost along a 12-35K-year age gradient. This grant will also be used to develop a network of astrobiology science in the CSU. Congratulations Dr. Mogul! Dr. Luis Campos, Associate Professor in the Chemistry Department at Columbia University will give the 2017 Goldstein Distinguished Lecture on Friday, April 7 at Kellogg West Conference Center on the campus of Cal Poly Pomona. Complete Interview TBA soon. Way to go Dr. Page! The winner of the 2016 Hiemenz Award is Daniel Vallejo and the 2016 Burke Award winner is Michael Torres, both chemistry majors. They won from among more than 500 students in the SEES program. Congratulations to both of these talented students! Dr. Chevy Axelrad Goldstein, Professor Emerita of Physical Chemistry was posthumously awarded the 2016 Distinguished Alumni Award in the College of Science. She earned her MS degree in Chemistry from Cal Poly Pomona in 1974, went on to her doctorate, and returned to CPP to join our department. Dr. Goldstein was known as a caring mentor to her research students, an outstanding teacher, and scholar. Congratulations to Nicole G. Perkins, recipient of the 2016 Goldstein Outstanding Student Research Award. She was honored (with a plaque and $2000 honorarium) at this year's 9th annual Goldstein Distinguished Lecture and Luncheon on April 29. In photo from left to right: Yu-Liang Hsueh (nominee), Ching Man Choy (nominee), Lisa Alex (Chair), Nicole Perkins (winner), and Leslie Aranda (nominee). Cal Poly undergraduate Chemistry major, Nicole G. Perkins, and chemistry graduate student, Elizabeth A. Martinez, were selected to present their posters at the annual national analytical chemistry conference, Pittcon 2016, held in Atlanta, Georgia. Congratulations Nicole and Elizabeth! Both of these students are mentored by Assistant Professor, Dr. Gregory Barding. Our Organic/Bldg. 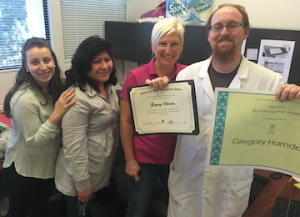 8 Stockroom Tech, Greg Harnden (IST II) was named Outstanding Staff Member in the College of Science for his service in Fall 2015. Congratulations Greg and thanks for all you do!! "The Electrochemical Study of ChargeTransferacrosstheLiquid/Liquid Interface", on March 3, 2016. Her work was carried out under the supervision of Dr. Peng Sun. Justin Tabay Cortez has been named the recipient of the 2016 Dr. Earl Pye Scholarship. This award recognizes outstanding academic performance (GPA 3.5 or higher) among freshmen and sophomore chemistry majors who show potential for successful careers in chemistry. Congratulations Justin! Congratulations to Dr. Greg Barding and Dr. Chantal Stieber for being selected as recipients of Kellogg RSCA Funding to support their research with students! Dr. Barding was awarded $8K for his proposal , "An in-depth study of drought and submergence stress on agriculturally important crops" and Dr. Stieber was awarded $10K for her proposal ""Probing Biological Conversion of Pollutants by Synchrotron Spectroscopy". Congratulations to Dr. Beauchamp who was selected as the 2015 recipient of the College of Science Outstanding Teaching Award. Dr. Beauchamp will be honored on November 5, when he will also present a seminar that describes the methods he uses to teach effectively. The seminar will be from 12-1 pm in 3-1637. The department awarded a total of $14,500 in scholarships this year thanks to the generosity of our many donors. We celebrated our students accomplishments at a lunch in their honor on May 21. This year's winners included Amanda Cao (Pye), Ching Man Choy (Ehsani & Valspar), Hassan Fakhreddine (Valspar), Lindsay Hetrick (Ehsani & Boeing), Sooji Lee (Ehsani), Uyen Pham (Ehsani), Craig Sheldon (Sorci), Melody Sycks (Valspar), Yunshi Tan (Weck), Daniel Vallejo (Weck & Boeing) and Jessica Williams (Boeing & Valspar). Congratulations to these outstanding students on their academic accomplishments! Our own Stephanie Pastor, IST III (Bldg. 4 Stockroom Tech), successfully defended her thesis and earned her MS in Chemistry. Congratulations to Stephanie! Congratulations to Dr. Rakesh Mogul and his students on their recent publication in Astrobiology. David Velazquez, an undergraduate chemistry major, was awarded first place in the Chemistry Poster Session at the Emerging Researchers National Conference in Washington, D.C.. He is pictured here with his research mentor Dr. Michael Page. Way to go David! Click here for additional information on impacted majors. Congratulations to the winners of this year's scholarships. These students were honored at a luncheon to celebrate their achievements on May 29 (see photo). The winners this year are Phelicita Bell (Dr. Earl Pye Memorial Scholarship); Anna Nguyen and Yue Zhou (Weck Scholarship); Nicole Berry, Huy Pham, Kristen Terminel and David Velazquez (Ehsani Scholarship); Craig Sheldon (Boeing Scholarship); Hassan Fakhreddine, Thu Van Tran, Anna Nguyen and Lindsay Hetrick (Valspar); and Hassan Fakhreddine (Mario Sorci Endowed Scholarship). We were able to award a total of $12,250 to these deserving and talented students as a result of our generous donors! Congratulations to Dr. Rakesh Mogul on his two recent publications! The first entitled “Overview of current capabilities and research and technology developments for planetary protection” was published March 3, 2014 in Adv. In Space Research. The second paper is entitled “Report of the workshop for life detection in samples from Mars” was published May 15, 2014 in Life Sciences in Space Research. Congratulations to Dr. Michael Page and his students for having their manuscript, "Soybean Oil: Powering a High School Investigation of Biodiesel" accepted for publication in the Journal of Chemical Education. The authors were Paul Rosa, Karen Azurin and Michael Page. Dr. Yan Liu, Assistant Professor in Analytical Chemistry, was awarded a RSCA mini-grant for $5,000 to develop a method for quantitation and stability of allicin in garlic extracts. He was also successful in obtaining additional funding of $5,000 to support students working in his lab. Congratulations to Dr. Liu! Dr. Michael Keith was awarded his pin for 30 years of service at Cal Poly Pomona at the Annual Service Awards Ceremony on September 22 (seen in photo)--congratulations Dr. Keith! Also receiving recognition for their years of service were Dr. Samir Anz (15 years) and Dr. Floyd Klavetter (10 years). “Characterization of hydrogen peroxide resistant Acinetobacter species isolated during the Mars Phoenix spacecraft assembly”. Authors on the paper are: Derecho, I.; McCoy, K.B. ; Vaishampayan, P.; Venkateswaran, K.; and Mogul, R. The first two authors are former graduates of our MS program in Chemistry! Dr. Michael Page was awarded tenure and was promoted to Associate Professor starting Fall 2014. Congratulations to Dr. Page!!! Congratulations to Dr. Peng Sun and his students, in collaboration with Dr. Samir Anz, on having their manuscript, “ Voltammetry of Ferrocenated Gold Nanoparticles on a Nanometer-Sized Electrode” published in Electroanalysis. The authors are Peng Sun, Tong Sun, Samir Anz, Jason Corey and Yunshi Tan. Excitement was high as students from local high schools, Centennial and Corona High, ran experiments under the direction of Dr. Ed Walton and Joelle Opotowsky here on campus in our labs. Students measured the amount of oxygen released from the decomposition of potassium chlorate in rock samples from various locations across the United States and explored how biodiesel fuel is produced. Sandra Gutierrez-Magallanez was acknowledged as the winner of the annual staff member of the year in the College of Science. The award was presented to her at the College of Science's Winter Luncheon on December 17, 2013. Congratulations Sandra! The SAACS student club (Student Affiliates of the American Chemical Society) received an “Honorable Mention Chapter Award” from the American Chemical Society for its 2012-13 activities. The group will be recognized at the 247th ACS National Meeting in Dallas, TX. Way to go students!!! Dr. Michael Page, Assistant Professor of Chemistry, was named program director for a $477K NSF grant entitled “College of Science Scholars Program” and for a $60K grant from the W.K. Kellogg Foundation entitled “SEES Research and Mentoring Program (S-RaMP)”. Both awards go to support and engage students in the College of Science, giving them opportunities to participate in research and encouraging them to pursue careers in science. Dr. Page is well known for his student support efforts having been recently recognized as the College of Science’s Outstanding Advisor for 2012-13. Congratulations to Dr. Page!